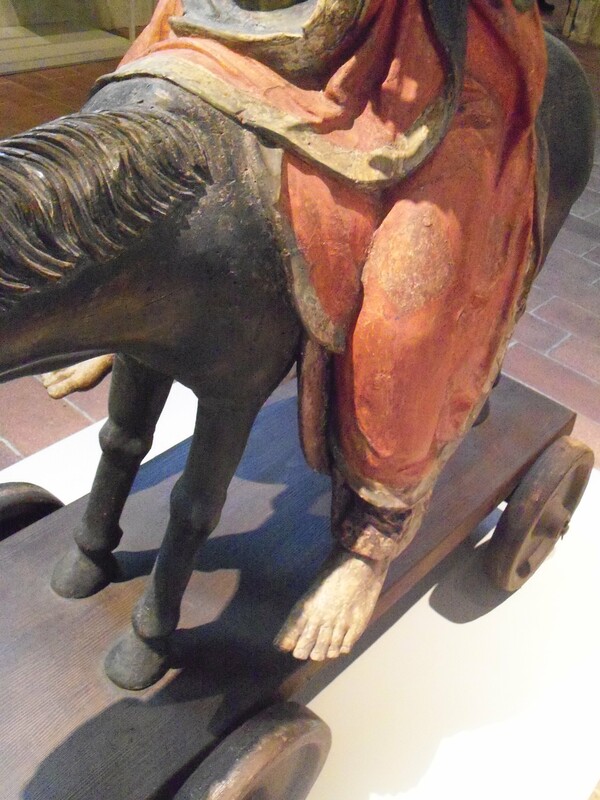 These two photos are of one wooden statue depicting our Lord riding the donkey…complete with wheels! It is on display at The Cloisters in Manhattan which is a museum of nothing but Christian Medieval Art. This particular statue was used in churches on Palm Sunday. In the daily Lectionary, today’s New Testament reading is the Triumphal Entry into Jerusalem and the meditation below reflects this Gospel. The meditation below is by Pr. Scott Murray in his excellent devotional A Year with the Church Fathers: Meditations for Each Day of the Church Year. The emphasis is my own for a post-script reflection. Meditation: When John Goodman’s character in the movie King Ralph is suddenly catapulted from utter obscurity to become the King of England, he initially exults in the power it gives him. He has a bowling alley installed in Buckingham Palace. However, it isn’t long until he realizes that power’s crown weighs heavily on the brow that bears it. Jesus comes from Galilean obscurity to Jerusalem, receiving the accolades of majesty from the frenzied crowd. Although they did not surprise Him, the burdens His kingly crown brings with it weigh upon His sacred head, wounding it for our transgressions. His coronation day is not an elevation to office, as we humans might think, but a condescension to our need. Like the unfortunate baseball manager who inherits a last-place team, Jesus has nothing but woe ahead of Him. King Jesus is acclaimed to humiliation and ignominious death. He comes not to subjugate, master, and overpower, but to suffer and die. His throne is nothing other than the cross. The crowd thought their hosannas would acclaim His power, and they were right in that He came to save. However, He came to save not by employing His power but by hiding it. He came to save not by menacing His enemies but by forgiving them. He came not to drive His subjects, but to make them His sons. Such is the one whom we hail as King. “What mental suffering the Jewish rulers must have endured when they heard so great a multitude proclaiming Christ as their King (Luke19:38)! But what honor was it for the Lord to be King of Israel? What great thing was it to the King of eternity to become the King of men? For Christ’s kingship overIsraelwas not for exacting tribute, putting swords into His soldiers’ hands, or subduing His enemies by open warfare. He was King of Israel in exercising kingly authority over their inward natures, in consulting for their eternal interests, in bringing into His heavenly kingdom those whose faith, hope, and love were centered in Himself. Accordingly, for the Son of God, the Father’s equal, the Word by whom all things were made, in His good pleasure to be King of Israel, was an act of condescension and not of promotion; a token of compassion, and not any increase of power. For He who was called on earth the King of the Jews is in the heavens the Lord of angels” (Augustine, Tractates on John, 51). The King ascends to heaven. Alleluia!/O come, let us worship Him. He ascends to heaven still to descend in “humble water, humble words, humble food”, for His Body, the Church, that is, in Holy Baptism, Preaching and Teaching of the Pure Word of God, Law and Promise and the Holy Communion. For 1,979 earth years He has been at the right hand of God the Father, to be with us all and by His scarred hand to preach and administer Word and Sacrament for His Church, for the life of the world through those whom He has called.